MASTER PROBLEMS Family and Home Improvement How to have happy family dinner conversations? How to have happy family dinner conversations? It is surprising how much time is often spent preparing material food for a family; yet no time may be spent on collecting and preparing the ingredient for dinner conversations, the food for the mind. Children especially come to the table with not only hungry appetites but with hungry minds. Parents may be most diligent to see that their children eat physically, but do they provide mental food for their children with the same zest and determination? In fact, conversations in many homes are not conducive to happiness. Most families do not get together; the only live together. They do not communicate ideas, but only debate on things such as what television channel can be agreed upon. Therefore do not realize how important the right kind of dinner conversations is and in which ways it can be a delightful happy time. What then, is required for happy conversations at dinner time? Let us examine some ingredients that help pave way for a happy family dinner. Happy faces and cheerful thought works wonders for digestion. Humor is a great aid in producing the cheerful atmosphere. This does not mean constant flow of jokes and puns, but with humor a person can see and express the funny or amusing side of things. When one has had a humorous experience during the day, share it with one’s family dinner companions. Look for the laughable side of situations. Yes the joys of humor come from pointing out the odd, peculiar and funny side of incidents. However, learn to make a distinction between what is comical and what is crude. A silly laugh or readiness to laugh on every occasion, regardless of the provocation, should not be confused with a sense of humor. It might rather indicate the need for self-control and for a more reflective spirit. So, use humor judiciously in making dinner times a happy time. In making a dinner happy don’t overdo things, remember to let the food gallop down your esophagus. This will enable you to enjoy a riotous laugh or a quick reply without choking yourself. Indeed a cheerful atmosphere paves way for the family members dining together to contribute to one another’s edification and enjoyment. Just as variety of food is enjoyed at a dinner, so variety in conversation is desirable. Though humor is vital ingredient for happy dinner conversations, there is not always a need for the subject matter to provoke laughter. Conversations may be entertaining and yet be educational; it may be enjoyable and yet contain something worth remembering. When selecting edifying topics of conversations for dinner guard against ponderousness, that is, subjects that is too heavy to blend in with enjoyable eating. Much of the enjoyment of a meal is lost if a person must concentrate on some problem or think profoundly on some matter. If heavy reflection is needed to discuss it, save that subject until after the meal. Happenings of the day, especially those that are unusual, colorful and entertaining provide conversational food. There are many are sources, then, for enjoyable, edifying conversations. 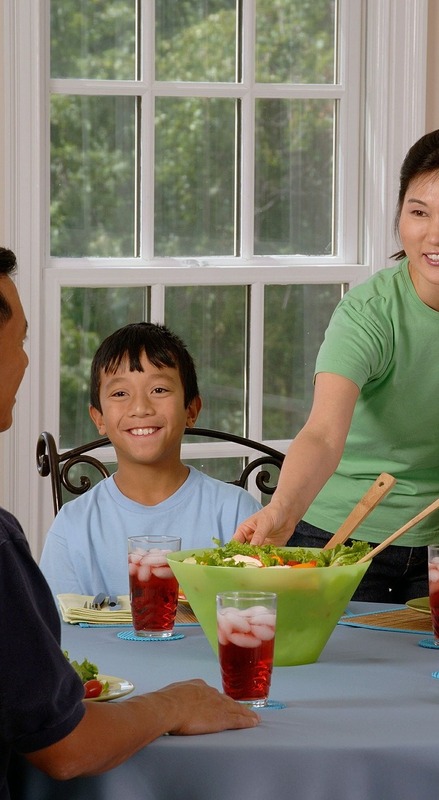 Be on the lookout for items of interest to share with other family members at dinner time. So that all can benefit from a happy dinner conversations, avoid the service station atmosphere. This is evident when some family members gulp down their food and without saying a word, dash off to attend to other affairs, perhaps no more important than watching television. Gulp-and-run meal time habits robs the family of a contribution to happy conversations and robs the person indulging in them proper mastication and digestion. Every member of the family should be encouraged to bring something of interest to the dinner table. When coming home, instead of telling all of one’s pleasant experiences, save some for dinner. It will require intelligent planning on the part of parents in particular, but a happy family conversation at dinner time is something for which all should strive for. So give your home a happy and wholesome conversations at dinner time. Show cheerfulness and judiciously use humor to lighten the mood. Make plans for uplifting and interesting conversations. Let each member of the family put forth effort to contribute something for the happy enjoyment and well-being of all.